Motörhead’s fast and furious ‘Ace Of Spades’ was written in 1980 and featured on the band’s 4th album Ace Of Spades. 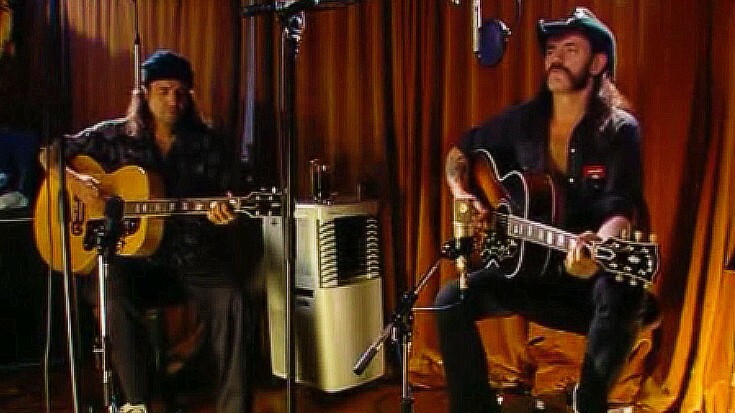 Known for late frontman Lemmy Kilmister’s gravelly, almost barked vocals, ‘Ace Of Spades’ received a new lease on life when together with Motörhead guitarist Phil Campbell, Lemmy delivered a slow, blues-tinged acoustic rendition that channels the spirit of all things rock and roll with a little bit of Robert Johnson’s ‘Cross Road Blues’ thrown in for flavor. I’m a lifelong Motörhead fan and I’ve heard ‘Ace Of Spades’ performed a million and one ways – yet somehow, this is my favorite. Fun Fact: Motörhead wasn’t Lemmy’s first taste of rock royalty. Before he joined Hawkwind and later, Motörhead, Lemmy was a roadie for Jimi Hendrix. All told, it goes without saying that this rendition of ‘Ace Of Spades’ is a pretty fitting send-off for one of rock’s biggest and most loved legends.